JVM이 포함된 버전은 32bit이므로 64bit JVM지원을 위해서 JVM이 포함되지 않은 generic 버전으로 다운로드 한다. 다운로드한 wls1036_generic.jar 파일을 서버의 /install 디렉토리에 임시 업로드한다. 설치완료후 삭제. weblogic 설치와 구동을 was라는 계정에서 돌리기로 한다. jdk-6u37-linux-x64.bin 이나 jdk-6u37-linux-x64-rpm.bin 등으로 다운받아 설치한다. 설치위치를 /usr/java/jdk16037 로 하기로 함.
was계정의 .bash_profile에 다음과 같이 변수 정의를 해준다. 웹로직 설치파일이 있는 위치에서 다음과 같은 명령어로 설치를 시작한다. Type "Next" or enter to proceed to the next prompt. If you want to change data entered previously, type "Previous". You may quit the installer at any time by typing "Exit". 미들웨어 홈디렉토리인데, /weblogic/Middleware 으로 지정함. ** remain uninformed of critical security issues in your configuration? 정말로 변경할 것임을 묻는 대화창에서 yes 입력. 보안업데이트를 받는 항목이 No로 바뀜. 엔터로 진행. 웹로직 설치유형을 묻는 화면. Custom 선택. core만 설치하기로 하며, Oracle Coherence 는 설치하지 않는다. 제거를 위해 2를 선택하고 엔터로 진행. JAVA환경을 묻는 화면에서 .bash_profile에 제대로 지정하고 넘어가면 위와같이 자동으로 인식되어 나온다. 여기서 바꿀게 아니라면 엔터로 진행. 웹로직 HOME 밑에 설치되는 웹로직서버 디렉토리. 사전에 약속된 /usr/opt/bea/wlserver_10.3.6 로 지정하고 넘어간다. 최종 설치선택 구성요소들을 확인하고 엔터로 진행. 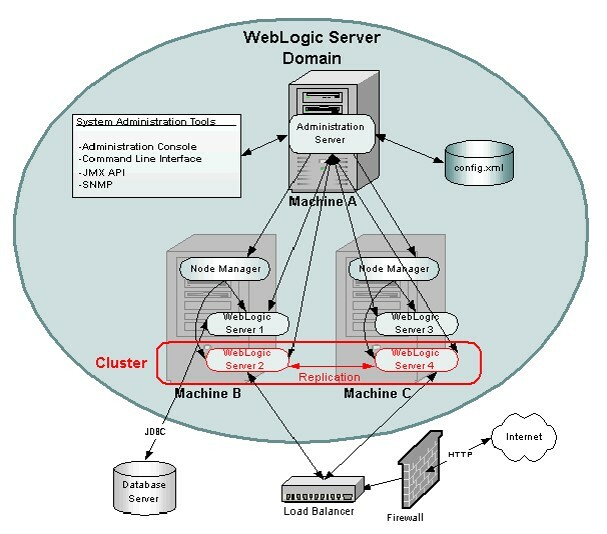 * Weblogic Server, Cluster, node-manager, Administration Server 등의 집합. | Use this option to add new components to an existing domain and modify |configuration settings. list of existing domain templates. |could be a custom created template using the Template Builder. 여기서는 웹로직서버 도메인을 구성할 것임. 선택되어있는 부분만 구성하기로 하고 엔터로 진행. 여기서는 test라는 도메인을 만들어보기로 함. /usr/opt/bea/domains으로 미리 약속된 도메인 디렉토리를 지정함. default administrator used to start development mode servers. 여기는 도메인관리를 위한 weblogic 계정 패스워드를 지정하는 것인데, 패스워드를 2번 입력해준다. Enter new *User password: OR [Exit][Reset][Accept]> test1234! Enter new *Confirm user password: OR [Exit][Reset][Accept]> test1234! Administration Server is used to perform administrative tasks. 2 - Modify "Listen address"
3 - Modify "Listen port"
4 - Modify "SSL enabled"
관리서버 이름을 원하는 이름으로 바꾸기 위해서 1 선택.